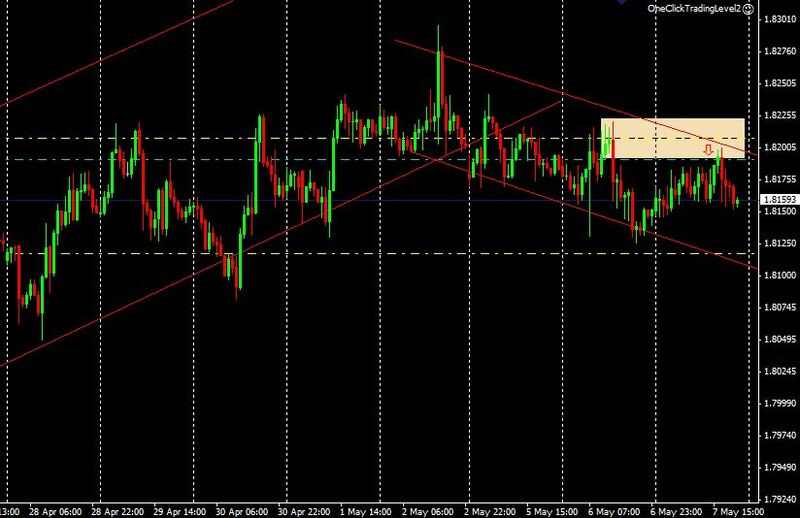 A little more activity in the forex market lately as a number of pairs have broken out of consolidations and provided trend trading opportunities. First let’s look at a recent trade, since it is the same set-up I am watching for in a couple upcoming trades. 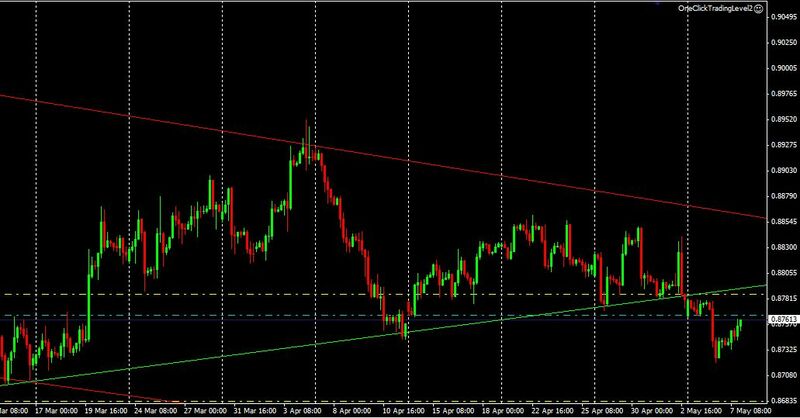 Last night I took a short in the GBPAUD. I placed the order before I went to bed and it was filled overnight. The chart shows the price moving in a trend channel higher. The price moves through this channel and then starts moving in a downward channel. The short (or “put” for those trading binaries) was taken because it was close to the upper portion of the trend channel, and the specific entry was chosen because it was at the valley ceiling of the last wave. My stop loss was originally above the white box (prior wave high), but has been moved down since a new lower swing high has formed. The chart shows the stop and target and level, as well as entry level (blue). The target is near the low of the down channel. If trading binaries, a similar entry can be taken, just allow enough time for the price to leave the area and move into the money. This in an hourly chart and typically it takes more than 5 hours to be solidly in the money. These types of trade signals occur a lot. Channels occur often, especially when NOT using exact highs and lows. Notice in the chart above the channel lines go through low and high AREAS, and don’t connect exact highs and lows. By doing this, the channel provides you a good approximation of where to get in and out and you’ll likely be able to see trades more clearly with these channels. Another trade I am watching is the USDCHF. It is moving lower in overall downtrend channel, therefore, I am looking for short (put) trades. We saw a rally (green upward sloping line) within the downtrend but that was recently broken. The price now has quite a ways to fall before reaching the bottom of the channel. To be conservative my target is above the channel bottom. Once again my entry order is placed at a valley ceiling from a prior wave, and is also just below the broken upward trendline which should now provide some resistance. A stop is above the prior wave high. This pair also typically takes more than 5 bars to clear the area–for this chart the bars are 4hours each. A short trade was documented a few days ago which worked out well: USDCAD Outlook Based on Price Action. With the last short having worked out, I am waiting for another. Entry (blue horizontal line) will require the price rally back up to the valley ceiling of the last wave. The entry will also be near a short-term downtrend line. Stop is above that prior wave high, and target is down below the recent lows (subject to change). The trend is down so I want to take short (put) trades, but I don’t want to chase the price lower. Rather, I want the price to come to me so I get the trade at a point I feel comfortable with and that suits my strategy. 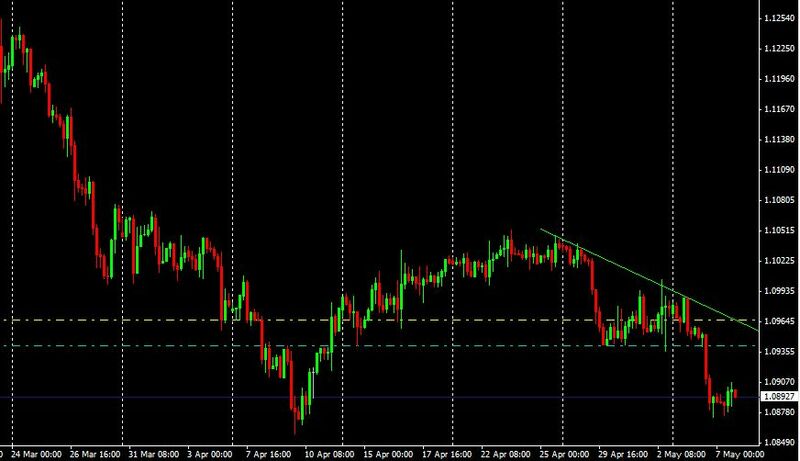 This strategy was developed for the forex market, and is profitable because gains can be much larger than losses. This strategy has not been tested on binary options where gains are typically smaller than losses. The strategy is also somewhat subjective and requires being able to determine in which direction to trade based on current trends, overall trends and making sure the price has enough room to run in your favor. Entries can also be tricky. Not every valley floor or ceiling is a good entry. Use the channels to help confirm which valleys to use for entries. If actively trading, wait for the price to enter the area you are expecting the reversal, then only take a trade once it starts moving back in the direction you expect. The entry method outlined in How I Pick Price Tops and Bottoms works well for this approach.